Hanin Zoabi claims abduction 'last resort' for 'frustrated Palestinians,' slams Arab Israeli teenager who supports rescue mission. 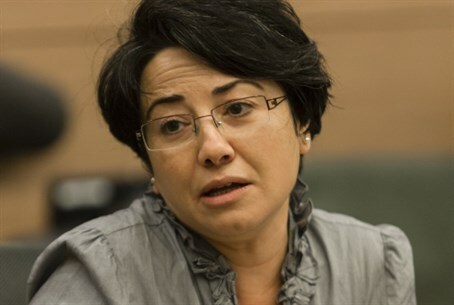 MK Hanin Zoabi (Balad) argued that the three kidnappers responsible for the abduction of three teenage yeshiva students are "not terrorists" on Radio Tel Aviv Tuesday morning, in an inflammatory interview which also saw her denigrate Arab Zionist and distant relative Mohammed Zoabi. Mohammed Zoabi, 17, courageously made a viral video showing support for the kidnapped boys, a move which garnered him both Israeli commendation and several death threats from within his Nazareth hometown. MK Zoabi initially denied that she knew the brave teenager well during Tuesday's radio interview, but then proceeded to insult him based on what she did know. "He's from a divorced family," she sniffed. "His mother now lives in Nazareth Illit, where he studies at a Jewish school." "He's sleazy," she continued. "He's distorted his identity." Zoabi then claimed that, in her "humble opinion," the kidnappers are not terrorists. "Is it strange that people who are under the Occupation and living an abnormal life, under an occupation in which Israel kidnaps Palestinian Arabs and jails them every day, go ahead and kidnap?" she fired. "They are not terrorists, I do not agree with you! They have seen no other way to change their reality and they have to resort to these measures until Israel sobers up a bit and feels the suffering of others." Interviewer Sharon Gal was shocked at the justification. "An Israeli MK, with these words, explicitly justifies the kidnapping of Israeli children," Gal stated. "I am surprised that a woman like you can still move freely around here, that is what surprises me." Zoabi replied, "Either I will continue to be interviewed, or I will not [anymore]," before hanging up the phone. The remarks caused a media furor in Israel, prompting concerns about the MK's safety. According to IDF Radio, a security detail has been stationed around Zoabi and close relatives ahead of a potential backlash.